Dealing with the death of a loved one is a profoundly painful experience. It is so painful, those who are close to someone who is grieving are often at a loss for words. Offering support during this time is important, though. 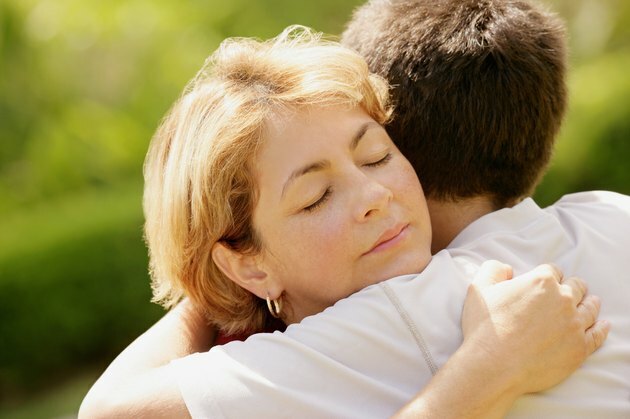 There are ways to tell your grieving friend or relative that you care. Simply say, “I’m sorry for your loss.” It’s straightforward and inoffensive. Say this to someone you may not know very well, such as a colleague or client. This message does not offer assumptions and is a short and simple way to show your love and concern. “You’re in my thoughts and prayers” acknowledges your care and concern for the person who is grieving. If the mention of prayers would offend, just tell him you're thinking of him. There’s nothing wrong with admitting your loss for words, especially if the death was sudden. “I don’t know what to say” is better than saying nothing. “He was a wonderful husband” or "she was a loving mother" will be welcomed by a grieving spouse or adult child. Don’t worry that you will create pain by bringing up the loss. This can open the door to a conversation and allow you to share a memory or two that your friend may appreciate. For example: "I'll always remember that surprise birthday party he threw for you. And you almost didn't show up!" Someone who has lost a loved one often wants to talk about her and reminisce. Let him know you’re there to listen by saying, “I’m here for you” or “You can call me any time.” Make sure he knows you're sincere about calling any time. People who are grieving sometimes feel that they’re intruding and won’t make a call unless they know your offer is genuine. You don’t have to wait for the person who has lost a loved to call. Follow up and ask how she’s doing. Instead of offering to help, actually do it. Don’t say “Let me know if I can help you with groceries.” Instead, show up at the door with them and ask if you can put them away.